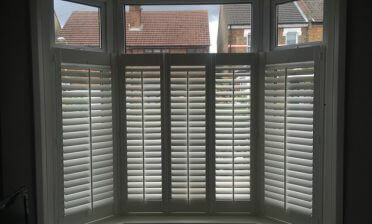 Shaun was in East Dulwich, South East London to fit these Tier on Tier Shutters to a Bay Window of a clients house. The customer was looking for a solution that would cover the whole of the window area, while still allowing maximum flexibility and light control. 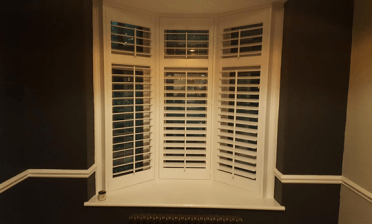 We often use Cafe Style Shutters on Bay Windows such as these, but with that style the top half of the window is left uncovered. Tier on Tier covers the top and bottom but allows each section to be fully opened, closed or adjusted anywhere in between. The shutters were created using MDF from our Antigua Range which is an affordable shutter solution without compromising on quality. 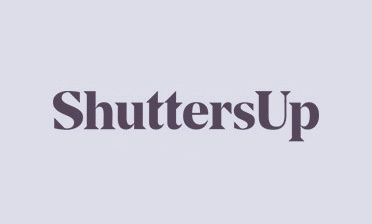 The shutters are made up of medium density fibreboard and coated in a polypropylene coating. 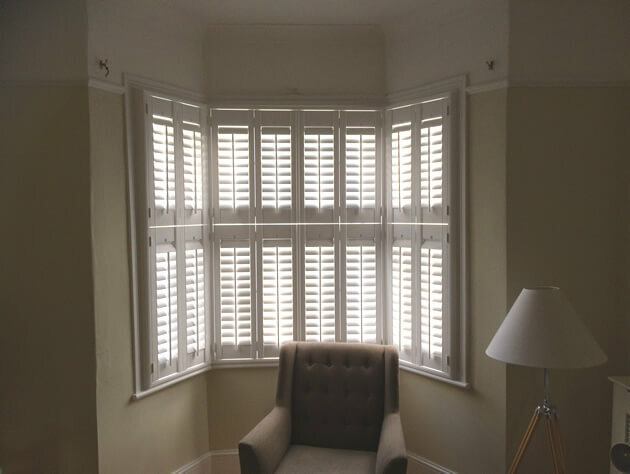 We used 63mm louvres featuring central tilt rods on each panel which helps to create a traditional look which would fit in with the overall look of the property. All the panels were finished in a pure white with matching hinges, fitted to the bay window using a 4 sided insert L frame. The finished product allowed the client to keep his room private from the street outside, while also allowing a highly flexible solution which can be adjusted and opened in a multitude of different ways to bring natural light into the room throughout the day.